There was a male stripper in a go-go bar. Or at least that’s how the song went…. I would like to say that I thought it was a pile of dross, but unfortunately this was a big song one fateful summer and everyone seemed to like it (myself included)…I didn’t recall the Blue Oyster Club rejects that consisted of the band however…but I remember liking it so much that a friend of mine (who was a keyboard genius) was able to recreate the thing perfectly. You see, what those young whippersnappers amongst you don’t get….the quality of music in any given generation is always deemed to be superb at the time. You even hold onto the idea throughout your life that it was actually very good….until someone plays it to you again many years later. Then you are more than a little scared. Then of course, the music comes full circle and gets popular again. Don’t get me wrong, there are some classics that will always stand the test of time, regardless of the generation that gave birth to them…but there are also some huge hits that are utter utter…well, a word hasn’t been invented to describe how utterly…whatever it is they are…but they are one..and an utter utter one at that. Just wrong..on so many levels. Always remembered by ladies of this generation with fondness. 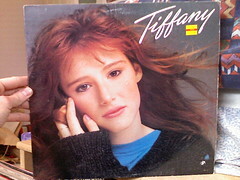 Anything by Tiffany does not stand the test of time….it didn’t stand the test of the present to be quite honest. If only it was possible to ensure that the answer to this question was a negative one. Responsible for making Grolsch Bottle tops a shoe based fashion accessory….need I say more. Now…I know that Rick Astley has gained some ground in recent years as a cult icon on the internet…but no….seriously, just no. This ginger haired former teaboy is one of the reasons that the combined might of Stock, Aitken and Waterman should have been put to death for crimes against peoples eardrums…. There are no words…an early precursor to the Cheeky girls in my opinion. Not only did she miss the talent train, she was actually at an airport wondering what was going on. Don’t get me wrong, it wasn’t all bad… I mean there was …. and who could forget …. ummm Circle in the sand – Belinda Carlisle…. wait, no no..that’s for the first list. I can honestly say that I must have been on some type of drug during the 80s and early 90s. Looking back with the rose tinted glasses I seemed to remember the music being pretty good. Then I look at some chart websites from the time and realise that not only are my new found glasses rose tinted, they have been blacked out from the inside. Similar things happen to TV shows, but I will leave that to another post. This entry was posted in Back In Time, Stuff and tagged random by Dave. Bookmark the permalink. If you use a Red Dwarf quote, you should really acknowledge it! And you thought no-one would notice!! Plus, I have to say that I’d disagree about Rik Astley’s Together Forever and Tiffany’s I think we’re alone now: Those 2 tracks alone would have the whole of Abu Dhabi on the heave ho. Half a million hookers can’t be wrong, right? If these tunes are so popular in Abu Dhabi…I am now officially glad I didn’t pursue going out there…what is the term for murder out there anyway?